Ben's been a great 2 year old. We've had a busted lip, bit tongue, a banged up eye, and a few miscellaneous owies in other places. and its only been a week! Fun times let me tell ya. 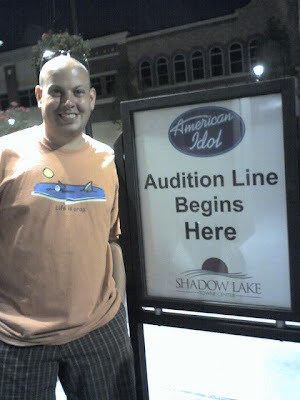 Anyway -- American Idol is auditioning in Omaha, and last Friday we went to Shadow Lake to the Sounds of Summer Concert series (the band was miserable) and we saw this sign. How appropriate that Pete's "life is crap" shirt is shown next to the American Idol sign. Too bad it wasn't August 10th when Pete was standing there. :( Love the big cheesy grin!